﻿The only concern we have about Adrian Beltre is that he’ll be 37 years old this season. The other concern we have for you, the fantasy baseball owner, is how you messed up in your draft to where you have to really weigh your options with Adrian Beltre. Will he kill you? No. Will he help? Actually, yes, but he won’t wow you in any way, at least not any more. 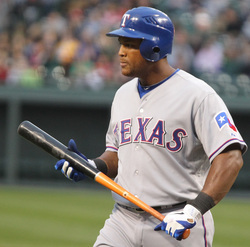 You can count on Beltre to hit 15-20 HR, although he’s not likely going to hit .300 ever again. Count on Beltre to just about duplicate his stats from last season… and we hasten to say this, but we also want you to be prepared with a backup third baseman. Turning 37 and playing every day is taxing on the body, and he’s been extremely durable for many, many years (he has played in 140+ games in 13 of his 17 full-time seasons). Time may finally catch up with Adrian Beltre a bit in 2016, although he's still worth a pick this year. *Age. Beltre will be 37 this season, and he's been playing since the age of 19. He's stayed healthy most of his career, but be leery at least a little bit. *Significant drop in slugging with age is no surprise. *Low strikeouts means he still puts the ball in play; should lead to good RBI and Runs scored. *Doubles remain consistent while HRs drop: could also indicate that a drop in batting average is permanent.